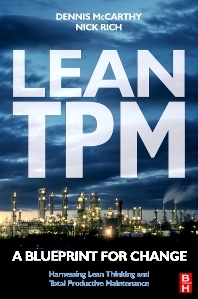 Merging the benefits of two well-known methodolgies, Lean Thinking and Total Productive Maintenance, Lean TPM shows how to secure increased manufacturing efficiency. Based on their experienc of working with organisations that have successfully achieved outstanding performance, McCarthy and Rich provide the tools and techniques that convert strategic vision into practical reality. Lean TPM accelerates the benefits of continuous improvement activities within any manufacturing environment by challenging wasteful working practices, releasing the potential of the workforce, targeting effectiveness and making processes work as planned. Lean TPM provides a single change agenda for organisations. It will help to develop robust supply chain relationships and to optimise the value generating process. Supported by an integrated route map and comprehensive benchmark data, this book enables engineers, technicians and managers to explore this potent technique fully. Unites the concepts of world-class manufacturing, Lean and TPM. Shows how to accelerate the benefits gained from continuous improvement activities. Includes an integrated route map for Lean TPM, including benchmark data. Senior managers. Quality, Process and Production managers in the process and maufacturing sector. World-class performance specialists. Supply chain managers and specialists. Process improvement engineers. Maintenance engineers. As a TPM expert, Dennis has pioneered the integration of TPM with Lean and Six Sigma improvement processes as a lever for cross functional collaboration and high performance teamwork. Described by one senior international manager as a true 'Sensei of Change', he has supported many well-respected and award winning companies including 3M, Ford, General Motors, GE, IKEA, Heineken and Johnson Matthey across Europe, India, USA, China and Japan. Professor Rich is a renowned academic and expert in productivity management and the application of lean enterprise methods. With Professor Dan Jones, he was a founding member of the Lean Enterprise Research Centre in 1994 and he now directs CLEAR – the Centre for Lean Enterprise Application and Research. Nick was trained by Toyota in Japan during the 1990s whilst at Cardiff Business School, he has co-authored several government reports, holds a number of honorary Professorships at UK and international Universities, and is highly regarded as an academic who can translate his research into practice. His research concerns the design and improvement of Highly Reliable Organisations and he spends his time split between manufacturing, service, and healthcare sectors.